This product comprises polymers designed to impart water-repellant properties to textile substrates by using an effective cross-linking mechanism. This hydrogen modified silicone has excellent rotational property helping generate hydrophobic surfaces. Further, it can be applied by padding or exhaust process to improve easy care properties to textiles. - Mono Proof SWP: Water based Water Repellent Coating. Victoria Infratech Projects Pvt. Ltd.
We have efficient workforce who can handle silicone water repellent coating.Silicone water repellent coating penetrates the substrate giving better results and providing longer life. Silicone Coating We have efficient workforce who can handle silicone water repellent coating which is manufactured by one of the esteemed company Dow Corning. Dr. Fixit (Pidilite). 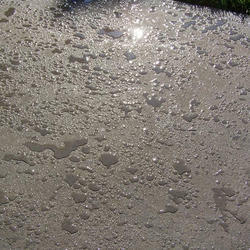 Silicone water repellent coating penetrates the substrate giving better results and providing longer life.